Leaving the home that hosts us again is always extremely difficult. On the last night of our eighth year, a pure and magnetic sound comes straight to the Goa Club DJ booth to give you the best music ever. New incoming astral conjunctions that have the charm and elegance of Raresh and Francesco del Garda. Two important names, two recognizable sounds, two stories to tell. To do the honors of two artists who are now part of the family, Giammarco Orsini and Christopher Ledger. In command, Fabrizio Sala. Raresh: Delicate and powerful, like when you combine minimal, tech and deep house with a very personal style. A name, his, which today is conquered a big chunk of the international electronic scene thanks to a 15-year-old apprenticeship, the passion for the mixer and the musical research, and thanks above all to random or desired fate encounters whose energy you can still perceive it, through the console. a:rpia:r, Praslesh, and then the friendship with Ricardo Villalobos and the Cocoon stable that becomes an extremely intense and lasting musical relationship, when we talk about someone able to earn respect from an early age, we are certainly talking about Raresh. Giammarco Orsini: It’s not just about Goa Club family or self-celebration, it is about skill, the real one, of humility, passion and perhaps all of these things together. Because a talent you perceive it even when it does not need to explode into useless forms of self-centeredness and delusions of omnipotence. A talent shines with its own light, remaining calm and reflecting a genuine, almost obsessive passion, capable of releasing a devastating energy in a dance of recognizable and authentic sounds. In the end, it’s all about connections. Connection between the disks, connection between people. Connection with the world around, to create feeling with the dancefloor through eclectic selections able to move the crowd and at the same time feel the atmosphere of that moment and transmit it simply by playing. Totally. Christopher Ledger: Inspired by artists ranging from Stockhausen to Aphex Twin from Debussy to Petre Inspirescu his musical works offer a timeless tale that reflects an authentic passion for sound design, synthesis of sound and classical acoustic instruments. From all this is born its label ‘CL Series’, the basis of significant productions including the first EP, released in November 2016, has received support from many established artists such as Petre Inspirescu and the rest of the crew of a:rpia:r. Innovation & tradition, shaken together make Christopher Ledger one of the emerging artists we prefer. But do not tell everyone! Fabrizio Sala: Beyond any technical consideration of an artist or his musical selection, however fundamental components, is the attitude that each dj has in relating and confronting his audience, record after record, evening after night, to make all the difference. 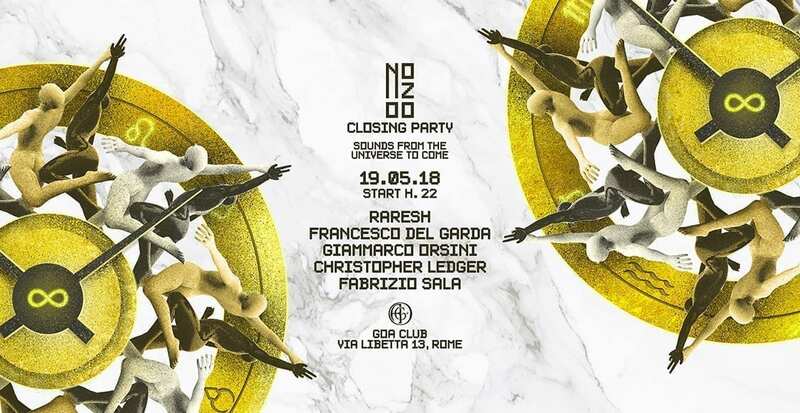 Saturday, May 19, Our Closing Party with the Nozoo homies: Fabrizio Sala.